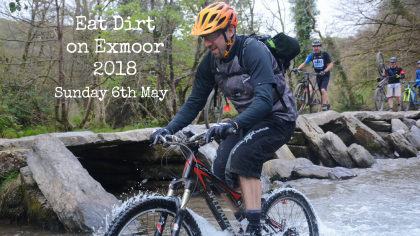 Eat Dirt on Exmoor is back for 2018! Thank you to all the fantastic riders who participated in our Eat Dirt On Exmoor events in 2016 and 2017! Eat Dirt on Exmoor is back for its third year, on Sunday 6th May 2018 (the Sunday before May Day Bank Holiday). Following feedback from riders on how much they enjoyed the route, we are running the same route as the 2017 event; around 22 miles of mixed terrain, much of which is not normally open to the general public. The event is now open on the British Cycling website for entries; entry price is £21, of which £19 goes to Calvert Trust Exmoor, £1 goes to British Cycling, and £1 goes to CareMoor for Exmoor, to help sustain access for all to the beautiful Exmoor countryside. To sign up please go to www.calvert-trust.org.uk/eatdirt, which will take you to the sign up page on British Cycling’s website.